THE previous post may have seemed harsh on Patently-O, but having followed the site for many years, we did notice a somewhat notable bias (unlike before). Academia is supposed to view things from an independent and open-minded viewpoint, but sometimes it gets seduced into one side of the debate — often the side that pays better. The other day Patently-O published a post for Tim Holbrook, Professor of Law at Emory University School of Law. 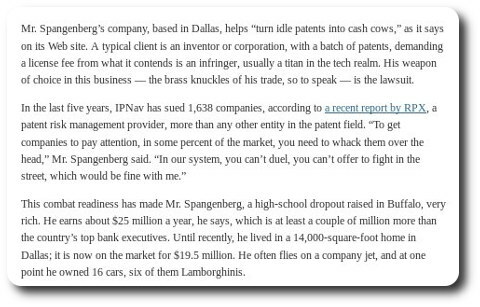 “The article at hand shows how the patent system has basically become the game of a bunch of law firms with proprietary software, not sole inventors like the mythology goes.”In our view, Texas gets far too much of the ‘action’ when it comes to patents, partly by disregarding the rules, ignoring precedence, and inviting patent trolls to judges that are notorious for pro-plaintiffs (or anti-defendants) bias. SCOTUS urgently needs to put an end to it. The whole situation has damaged the perception of patent justice and generally discredited much of the system, demolishing public consent to it. How many people in the US still view patent law — with all the patent trolls they keep reading about — as desirable? If very few, then maybe policy is the problem, or the push towards patent maximalism where public interests are altogether disregarded. The EPO has recently accomplished the same thing — to the point where 0% of EPO stakeholders support the EPO's management and an identical number (it doesn't get any lower than this) of well-paid EPO staff say they support their management. “We heard similar stories about the EPO; EPO stakeholders who chose not to waste money on law firms were urged to do so by the EPO and were repeatedly rebuffed by the EPO — to the point where the whole process (for one single patent) cost as much as a whole house!”How many people other than law firms can afford such software? It seems like the whole system has become the den of few law firms rather than actual inventors who can follow instructions and get patents granted. This new book, “Patent Office Litigation,” is in fact composed by a law firm, not actual inventors. It says a lot about what the patent system became in the US. We heard similar stories about the EPO; EPO stakeholders who chose not to waste money on law firms were urged to do so by the EPO and were repeatedly rebuffed by the EPO — to the point where the whole process (for one single patent) cost as much as a whole house! It got so serious that one single case was eventually escalated to British and EU-level authorities, to no avail (because the EPO enjoys immunity). As you know, it used to be you could file a complaint for patent infringement using Form 18, which barely said anything beyond “Plaintiff owns a patent, and you infringe it.” Nowadays, patent infringement complaints, like all others, must comply with Iqbal and Twombly, which require pleading factual material that, if taken as true, plausibly states a claim upon which relief can be granted. A while back, I wrote about how this is going to be difficult to do in some cases: how do you gather a Rule 11 basis to plead plausible facts when, for example, the claimed method is practiced by a corporation inside its well-guarded factory? A recent decision, Harvard v. Micron (17-11249, D. Mass. Jan. 31, 2017) (available here), gives a real world example of this. The original complaint alleged that the patented method was commonly used to perform the accused process. The defendant moved to dismiss, asserting that this was not enough to make it “plausible” that, in fact, the defendant used the method. NOV initially refused to produce the ACA, instead producing only a “Assistant Secretary’s Certificate,” which assigned only “physical assets.” After being forced to produce the ACA, Omron renewed its motion to dismiss for lack of standing. The district court agreed that that NOV could not prove ownership of the ’142 Patent as of the filing date of this case, and dismissed the case, with prejudice, for lack of standing.